Codeofchina Inc., a part of TransForyou (Beijing) Translation Co., Ltd., is a professional Chinese code translator in China. Now, Codeofchina Inc. is running a professional Chinese code website, www.codeofchina.com. Through this website, Codeofchina Inc. provides English-translated Chinese codes to clients worldwide. TransForyou (Beijing) Translation Co., Ltd., established in 2003, is a reliable language service provider for clients at home and abroad. Since our establishment, TransForyou has been aiming to build up a translation brand with our professional dedicated service. Currently, TransForyou is the director of China Association of Engineering Construction Standardization (CECS); the committeeman of Localization Service Committee / Translators Association of China (TAC) and the member of Boya Translation Culture Salon (BTCS); and the field study center of the University of the University of International Business & Economics (UIBE) and Hebei University (HU). In 2016, TransForyou ranked 27th among Asian Language Service Providers by Common Sense Advisory. "Sincerity" is involved in every growth step of Codeofchina. We offer you professional, reliable, just-in-time translation services, which you can experience deeply when you contact with us. Translation is a work of conscience rather than any other things. Whether the translation is qualified or not can be pre-determined in the selection of draft translators. In Codeofchina, the error-free translation quality is guaranteed through the know-how of experienced full-time translators, as well as the sophisticated processes in which at least three specialized translators are involved, following ISO 17100. Codeofchina’s founder and CEO, Mr. MENG Yongye, is a Ph.D. in business English studies. Under Mr. MENG’s leadership, our management team is consisted of masters of translation and interpretation (MTIs) graduated from the Peking University (PU), UIBE and HU. In recent years, Codeofchina has translated 30 million words per annum and accordingly has accumulated substantive translation experience and know-how through more than 50 full-time translators/interpreters. Codeofchina has been equipped with state-of-the-art computer-aided translation (CAT) software, which enables translators to improve their accuracy and efficiency via sharing term and sentence database in WAN and LAN. Our process is divided into four phases: "draft translation - draft proofreading - professional proofreading - literal proofreading - final proofreading", which is accredited according to ISO 9001 Quality Management Certification system. All codes available on Codeofchina.Com are translated by experienced in-house translators, following the requirements stated in ISO 17100. 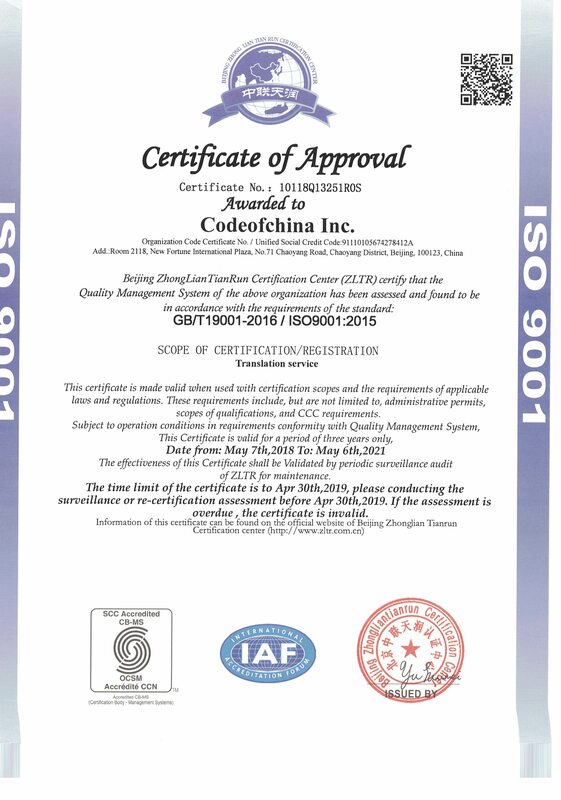 As a director of China Association for Engineering Construction Standardization (CECS), Codeofchina’s parent company, TransForyou, has been specialized in the Chinese code translation since 2006. In these years, Codeofchina has translated more than 15,000 Chinese codes, and officially published the English versions for more than 200 codes already. All the English-translated Chinese codes are licensed to Codeofchina for expanding its overseas business via the platform of www.codeofchina.com. Codeofchina.com is a mature Chinese code translation platform for clients home and abroad. Everyday, tens of clients contact Codeofchina.com to seek for the English versions of Chinese codes. Since a single translated code can be sold to one or more clients, Codeofchina.com can provide the English versions to clients at an extremely low price. Our key account list covers Rolls-Royce, Man, Disney, Hatch, GE and Siemens.